Should start times change in the district to allow high school students to sleep later? That's the question school board members are considering. Read more online. On Thursday evening, board members will be learning more about how a potential change in school start times might impact students at all levels - from elementary to high school. The discussions are open to the public and will take place on March 8 at Stillwater City Hall. Video of the meetings will be available online. High School Start Time Research Presentation from 4:30 to 5:30 p.m.: A presentation by a University of Minnesota researcher and a representative from the Minnesota Sleep Society will review the research regarding high school start times. School Board Meeting at 6 p.m.: During the regular board meeting school board members will hear more about the impact of a later high school start on elementary and middle schools. Board members will have time to discuss the issue of start time changes and determine whether or not they want to direct administration to prepare a formal proposal to change start time for 2019-2020. The Minnesota Elementary School Principals’ Association (MESPA) has recognized Heather Nelson, principal of Rutherford Elementary School, with the 2018 MESPA Division Leadership Achievement Award. The award honors principals whose exemplary leadership and sustained efforts have made noteworthy contributions to the operation of effective school learning programs — improving education, their communities, and their profession. Nelson has served as a principal in the district since 2002. We know how important it is that teachers, schools and the district shares information with you on a regular basis. We want to make sure what we are doing is working and if it’s not, we want to fix it! You can help by completing an anonymous, 26 question communication survey. You can access the survey here. It will take about 15 minutes to complete. Hundreds of future Ponies from across the school district had the opportunity to visit kindergarten classrooms as part of Kindergarten Orientation. Students met their teachers, made new friends, sang songs, created works of art and rode a school bus. Clifford the Big Red Dog even made an appearance! We are so excited to welcome you to our school communities this fall! Photos on Facebook. Congratulations to the St. Croix Valley Area Learning Center students who graduated on Friday! Eight graduates were honored at a special ceremony. They received their Stillwater Area High School diplomas in front of proud family and friends, fellow students and staff. We are excited to see what the future holds for them! 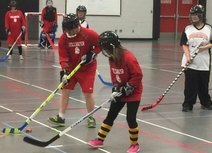 Stillwater Area High School has its first-ever adapted floor hockey team. It’s a cooperative between Stillwater and Mahtomedi. The co-ed team is made up of eight players, including five from SAHS. The team competes in the southern metro area against teams as far away as Owatonna. Coach Jon McAllister says the inaugural team is gaining experience every day and he’s proud of them for playing hard no matter what the score is. Afton-Lakeland principal Malinda Lansfeldt kept her word. She told students that if they raised $18,000 for their PTA fun run fundraiser she would get slimed. Well, the kids reached that goal and them some so they got to pour the gooey green mess all over her. A big thanks to Mrs. Lansfeldt who endured 20 minutes of sliming all for a good cause. The money will go towards teacher grants and updating/adapting the playground. Watch the video on Facebook. Parents of Brookview Elementary first graders got a sneak peek at what goes on during the school day. 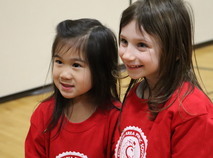 Parents were invited to tag along with their children as they visited specialists in music, art and physical education. Photos on our Facebook page. The school board will meet with area legislators for Schools for Equity in Education Day at the State Capitol on Thursday, March 15 from 9:45 a.m. to approximately 2:00 p.m. Read official notice online.